Protecting the iconic landscape features on the Goulburn River, including The Drip, is a major campaign of MDEG. We are calling on the NSW Government to extend the Goulburn River National Park to include all of The Drip block (Lot 45 DP750750) behind this special place as well as with the river corridor and walking track to the west – linking it to The Drip Picnic reserve and car park on the Ulan – Cassilis Rd. The Drip and Corner gorges of the Goulburn River form part of an ancient, visually dramatic landscape. Many visit this iconic and culturally significant place to experience its natural beauty and extensive Aboriginal heritage, walking along the Goulburn River or picnicking under soaring sandstone cliffs. Clear spring water drips and seeps through sculptural rock formations laden with ferns, bottle brushes and weeping grasses. The Drip gorge sits on the western most lip of the Sydney sandstone basin and on the lowest point of the Great Dividing Range. It is only a short walk (1.4 kilometres) from the Ulan-Cassilis Road and is widely used by the community, tourists and schools for recreational, educational and cultural purposes. 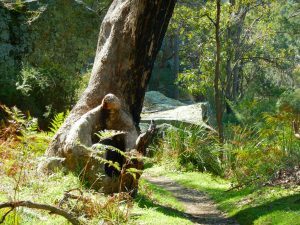 It allows families to have a ‘wilderness experience’ similar to walks in the Blue Mountains Heritage Area or Northern Territory gorges. There is also a recent coal mining history amongst these beautiful cliffs and river gorges. Prior to the 1980s a pit and prop coal mine, still using pit ponies to haul the coal, dug small quantities to supply the local hospital. In the early 1980s Ulan Coal Mine was expanded with the development of a large open cut mine followed by a underground longwall operation. This involved diverting 5.2 kilometers of the Goulburn River around the open cut pit. Environmental impacts from open cut and underground mining threatens the long term health, resilience and viability of this river system. These include a rise in algal blooms promoted by the build up of clay and silt in the sandy river bed from the discharge of highly turbid water after storm events and ongoing legacy of the river diversion; significant increase in river salt loads and unexplained salinity spikes; plus the loss of groundwater base flows that maintain critical stream flows during extended dry periods. All examples of coal mining impacts that affect this sensitive environment. Since 2004 two more mega coal mine developments were approved across the headwaters of the Goulburn River – Wilpinjong Coal Mine (Peabody) and in 2007 Moolarben Coal Operations (Yancoal). The current approved underground mining footprint in the Ulan Wollar area has grown to nearly 145 square kilometres with an approved total open cut area of over 68 square kilometres. The licensed extraction of water by the coal mines, including incidental take (interception) of groundwater, as predicted in mine reports, will exceed 42 ML/day over the next decade. In 2015 the combined water usage by Ulan, Moolarben and Wilpinjong coal mines was estimated at 8,650 million litres (UCML, 2015b; MCO, 2015; WilpinjongCoal, 2015). All three mines have been granted pollution licenses by the government that permit offsite discharge of treated mine water and spillage from sediment dams. During 2016 Ulan Coal Mine discharged around 8,000 million litres of treated mine water offsite, carrying an estimated 4,287 tonnes of salt (UCML, 2016). The chemical composition of saline mine discharge water can differ significantly to what naturally occurs in surface waters. Mine de-watering, seepage and the discharge of excess mine water in the upper Goulburn is increasing downstream salt loads, altering the natural flow regime, and changing surface and groundwater chemistry. The relative proportion of ions in saline waters as well as other co-occurring environmental stressors (e.g. turbidity) can have a combined greater effect on ecosystem health than total salinity (Kefford et al., 2013, Krogh et al., 2013). The impact of mine water discharge on macro-invertebrates and groundwater stygofauna requires further research. Rehabilitation of massively disturbed mined land is a slow unproven process, so far no mined areas can be regarded as fully restored despite nearly 40 years since the commencement of the first open cut. The long term impact and future recovery of the groundwater levels is one of the key major issues facing the river system. Mine modelling predicts well in excess of 100 years until depleted levels may stabilise. Until then the river and dependent ecosystems have lost crucial groundwater base flows, reducing their resilience and increasing their vulnerability to drought. The expansion of coal mining in this area has a significant negative impact on unique and threatened species and their habitat. The Moolarben Coal open cut and underground operations affects 226 hectares of the Critically Endangered White Box/ Yellow Box/Blakely’s Red-gum Ecological Community removing threatened species habitat for woodland birds, bats, owls and iconic native mammals. The critical woodlands to be destroyed provide habitat for nationally listed endangered animal species including the Swift Parrot, Squirrel Glider, Painted Honeyeater, Hooded Robin, Diamond Firetail and the now Critically Endangered Regent Honeyeater. Studies have also identified the occurrence of habitat for the threatened Brown Treecreeper, Speckled Warbler, Gilbert’s Whistler, Glossy Black Cockatoo, Powerful Owl, Large Bentwing Bat, Large-eared Pied Bat and Greater Long- eared Bat. Foraging and breeding sites will be lost, especially from areas where there is a high density of tree hollows. 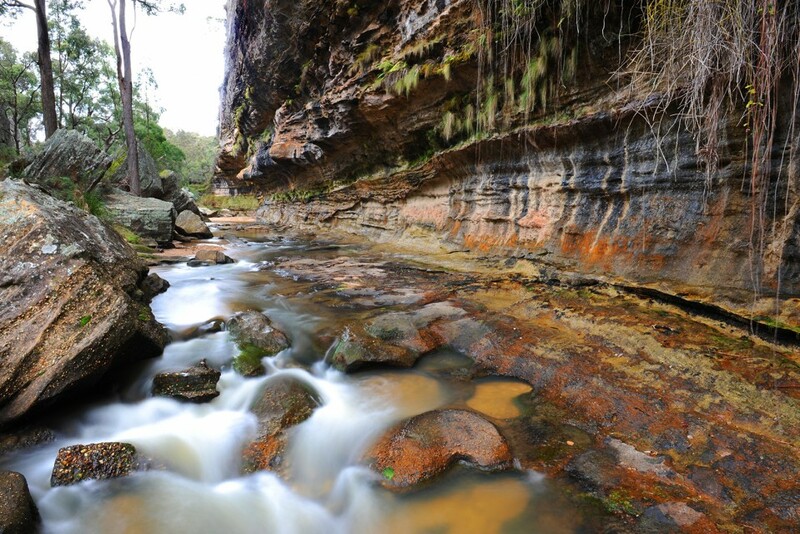 Impacts from the Moolarben Mine Stage 2 will also be felt from the removal of several kilometers of creek habitat and significant cultural landscapes along the Murragamba Creek and Eastern Creek valleys, including two groundwater dependent ecosystems. The impact of these three large and expanding mega coal mines in the Ulan Wollar area raises many questions about interference to regional groundwater and long term viability and integrity of the Goulburn River, a major tributary of the Hunter River. The combined total water being removed from the groundwater system by mining is predicted to exceed 42 million litres per day. The local community has also expressed their concerns with the risks to surface water, damage to the Drip and Corner Gorges, impacts to groundwater dependent ecosystems, fears of local tourism industry decline, dust, noise and an overall inadequate assessment of cumulative and regional impacts associated with these three mining operations. There is broad and enduring community and agency support for the protection of the highly valued and regionally significant Drip Gorge riparian area and adjacent escarpments by incorporating this sensitive river corridor into the Goulburn River National Park. It is now widely accepted that the significant cultural, spiritual, historical, educational, tourism and recreational values associated with The Drip and the Corner Gorge should lead to their protection. Moolarben Coal Mine currently has approval to mine as close as 150 metres from the river and 400 metres from the Corner gorge. There should be a two kilometer wide buffer that excludes mining from the Goulburn River in the vicinity of The Drip and Corner gorges for inclusion into the national estate for the people of NSW. 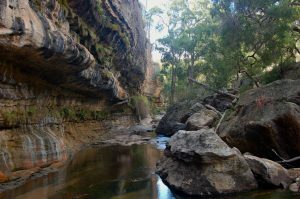 Protect the Goulburn River and adjacent sandstone escarpments surrounding The Drip Gorge from mining by extending the Goulburn River National Park to include the whole river corridor. Commission an Independent Regional Water Survey and cumulative impact study to determine the full environmental impacts of all three mines on the groundwater and river systems of the Upper Goulburn River catchment. Kellett, J. R., Williams, B. G. and Ward, J. K., 1989. Hydrogeochemistry of the upper Hunter River valley, New South Wales, Australian Government Publishing Service Canberra. Krogh, M., Dorani, F., Foulsham, E., McSorley, A. and Hoey, D., 2013. Hunter Catchment Salinity Assessment: Final Report, Report prepared by Office of Environment and Heritage for the NSW Environmental Protection Agency Sydney, Australia. Available at: www.epa.nsw.au (accessed 20/12/2013). MER, 2011. Environmental Assessment – Modification of Ulan Coal CONTINUED OPERATIONS – Appendix 3 Groundwater Assessment Report Xstrata Coal Toronto, Australia. UCML, 2016. Ulan Complex Annual Review GLENCORE, Mudgee NSW.